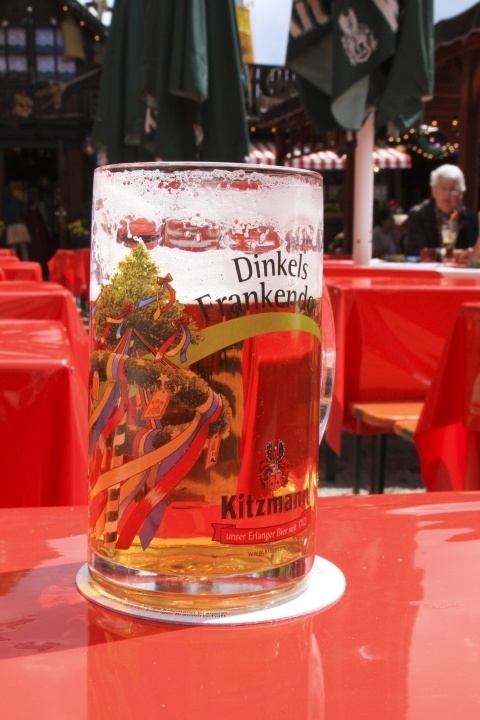 The second largest beer festival in Germany is the Erlangen Bergkirchweih held at the beginning of June each year. It’s all about the beer in Erlangen. Perched up on the mountain, this beer fest began with tastings throughout the “caves” where the beer is stored. 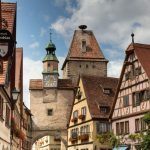 Unlike the sprawling Oktoberfest held in Munich, here you must climb and wind your way between trees, small alleyways, and all the caves built into the side of the mountain. There are a number of beers represented as you walk across the face of the mountain. As you can see the waitresses and bartenders stay nice and cool in the caves where you can sit inside, outside, or even on top to enjoy their wares. 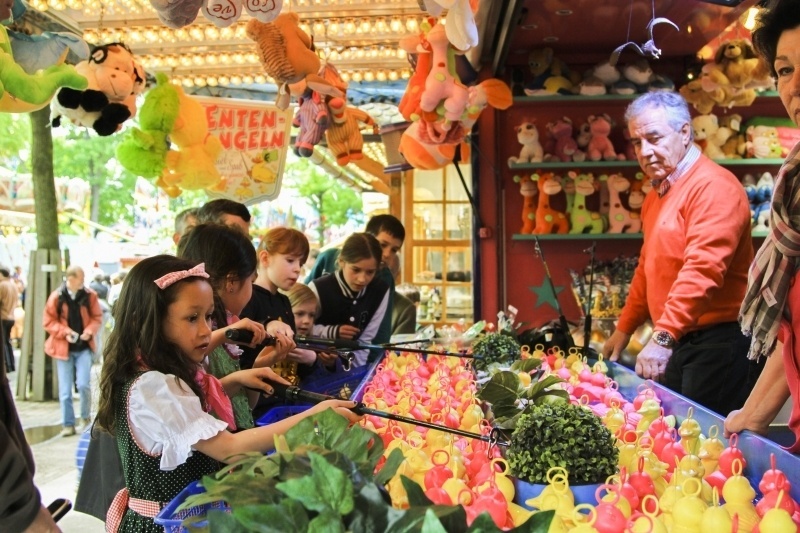 Bavarians (and Germans) of all ages come to the fest to eat, ride the rides, play the games, and just have a great time. 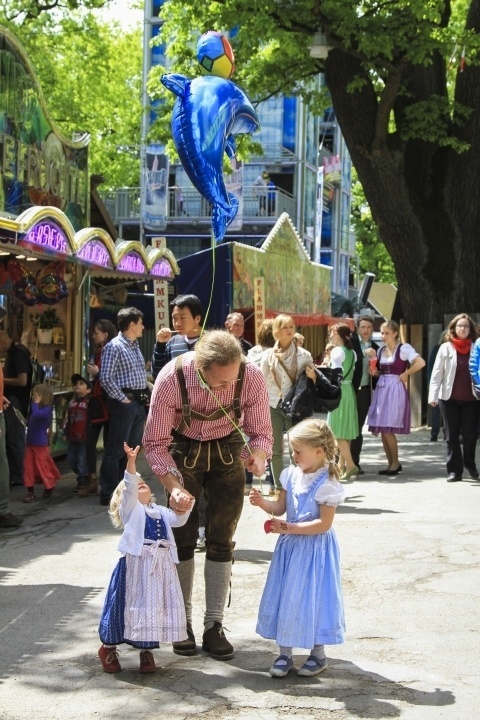 Most Bavarians wear their traditional “trachtenmode” or traditional clothing. 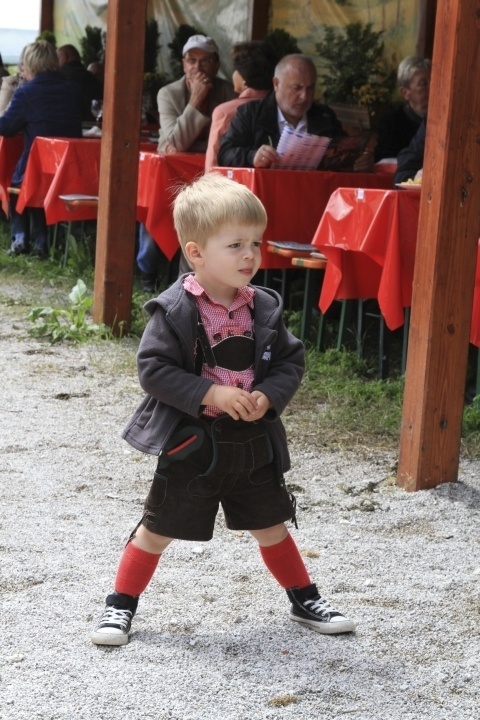 This little boy is sporting his “lederhosen” or leather pants. 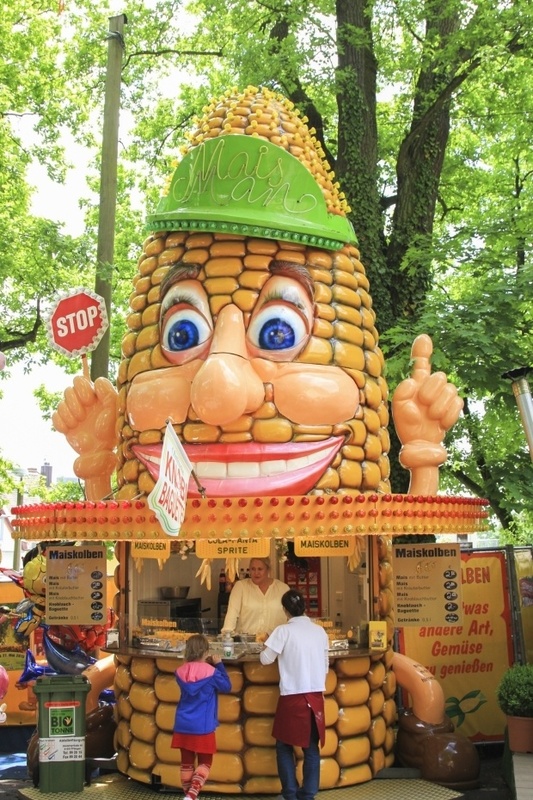 Who doesn’t enjoy a cup of cooked corn during a break from the rides? Choosing the right ducks is important here. You add up your points to claim your prize. These little girls are enjoying their balloon, even though it’s tough to manage. And what fest is complete without some good fatty fest food. 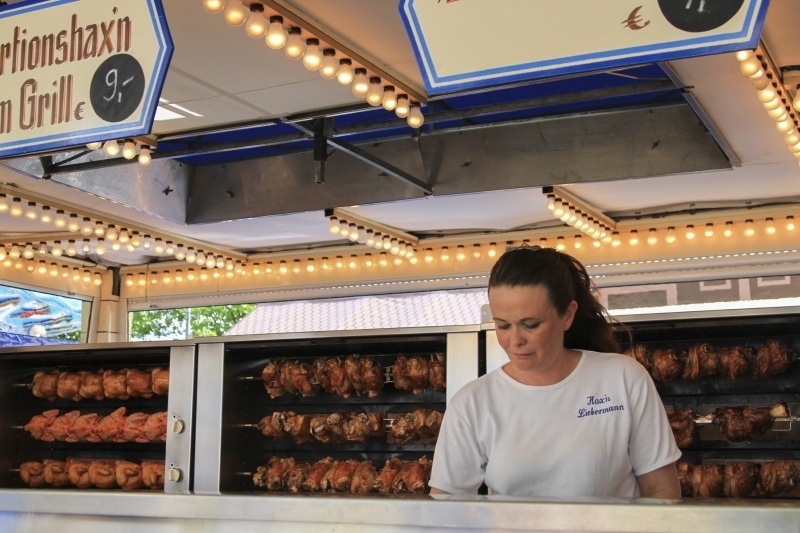 This vendor sells drippy, delicious haxen (pork knuckles), ducks, or chicken. Yum. Yum. 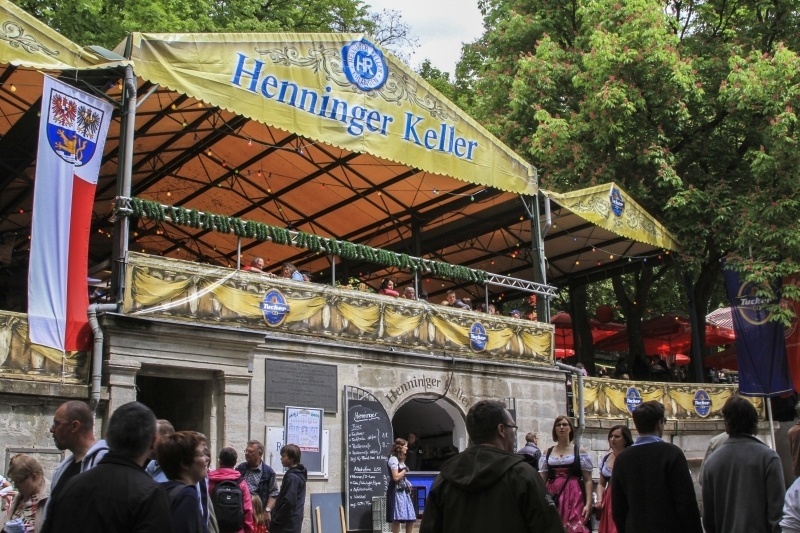 The Erlangen beer festival might not be as famous as the Okotberfest, but they still have oompah bands, great food, lots of rides and games, and a whole lot of beer. Don’t miss it! 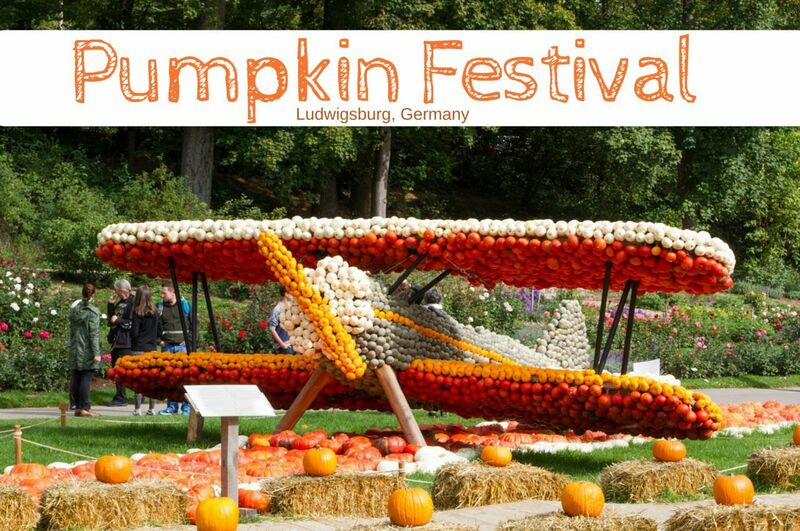 Have you been to the Erlangen Bergkirchweih Festival? Tell us what you thought! Ah, so I just missed all the great beer! I love Bavaria and really hope to go back one day and explore a bit more! Tiana Kai – If you get the chance to be in Erlangen for the fest, you need to do it. I absolutely loved it. I’ve heard many Bavarians say they prefer it to the Munich Octoberfest because there are fewer crowds. I’m not so sure about that. It felt really crowded to me, but I did enjoy every minute of it! Thanks for your comment!